On the morning of 20 December the Americans defending St. Vith held the easternmost position of any organized nature in the center sector of the Ardennes battleground. The most advanced elements of the German drive by this time were twenty-five airline miles to the southwest of St. Vith. The St. Vith perimeter, now of substantial size, continued to act as a breakwater holding the LXVI Corps in check while other German units forged westward past its northern and southern extensions. As yet the enemy forces passing to the north and south had failed to coalesce to the west of the St. Vith perimeter. The northern penetration, represented at its tip by the 1st SS Panzer Division, remained narrow and road-bound. Well to the rear of the 1st SS the 9th SS Panzer Division, reinforced by the 519th Heavy Antitank Battalion, was toiling slowly westward on the single, free main road which served as the main supply route for two armored 4 and two infantry divisions. The advance guard had arrived near Recht the previous evening. The southern advance, which had carried a mass of German armor and infantry from the XLVII and LVIII Panzer Corps toward Bastogne and Houffalize, had the troops and the maneuver room to constitute a real threat to the southern and western sections of the St. Vith perimeter. The German successes in this area had already isolated the St. Vith forces from the remainder of the VIII Corps, although a slim connection remained between the 7th Armored Division rear installations at La Roche and the VIII Corps headquarters at Bastogne. Communication between the 7th Armored rear headquarters and the St. Vith command post (thirty-five miles by road) was extremely difficult. Communication between the VIII Corps headquarters and the St. Vith command post was almost nonexistent, even by radio. I am out of touch with VIII Corps and understand XVIII Airborne Corps is coming in. My division is defending the line St. Vith-Poteau both inclusive. CCB, 9th AD, the 424th Inf Regt of the 106th Div and the 112th Inf Regt of the 28th Div are on my right and hold from St. Vith to Holdingen. Both infantry regiments are in bad shape. My right flank is wide open except for some reconnaissance elements, TDs and stragglers we have collected and organized into defense teams at road centers back as far as Cheram [Chérain] inclusive. Two German Divisions, 116 Pz and 560 VG, are just starting to attack NW with their right on Gouvy. I can delay them the rest of today maybe but will be cut off by tomorrow. VIII Corps has ordered me to hold and I will do so but need help. An attack from Bastogne to the NE will relieve the situation and in turn cut the bastards off in rear. I also need plenty of air support. Am out of contact with VIII Corps so am sending this to you. Understand 82AB is coming up on my north and the north flank is not critical. by the collection of American armor confronting him-"tanks were everywhere," said the 18th Volks Grenadier Division-and by the amount of artillery fire his every movement attracted. It must be added, however, that Lucht's LXVI Corps was not in position to bring off the smashing attack against St. Vith which had been set tentatively for the 20th. The Fuehrer Begleit Brigade, whose tanks were supposed to add new punch to operations of the infantry corps, was still strung out along the jammed and miry roads east of St. Vith. Its commander, Colonel Remer, impatient with delay, had ordered an assault west of Wallerode at midnight on the 19th, but the small detachment of armored infantry and assault guns at hand came under shellfire each time it formed for attack and Remer finally gave over the whole idea. Before daylight some of his tanks arrived in the woods west of Born. Having convinced the corps commander that direct attack on St. Vith from the east was no longer feasible, Remer tried to make good on his own favored plan for an armored flanking attack in the north even at the risk of a piecemeal effort. East of St. Vith the 18th Volks Grenadier Division was regrouping as it waited for its artillery and trains, involved in the traffic jam caused by the Fuehrer Begleit columns. As usual, attempts to bring up the horse-drawn caissons past the armor only resulted in more delay and confusion. The division commander, General Hoffmann-Schönborn, did try a piecemeal attack on the high ground north of the Schönberg road with the intent to seize the St. Vith railroad station. He personally accompanied the 295th Regiment in the assault. The attacking troop assembled in Wallerode toward midmorning where they offered wonderful targets for the artillery supporting CCB, 7th Armored. The gunners, as infantry observers reported, "threw everything at Wallerode but the shoes on their feet." Within half an hour the German regimental commander was hors de combat and the attack dissipated. Although action had flared up on 20 December along the eastern face of the St. Vith perimeter, the feature of this day was the series of rearrangements to tighten the perimeter on the north and south. Hasbrouck earlier had been "suspicious" of what was happening in the northern sector around Recht and Poteau, but he was no longer too apprehensive after the successive march groups of the 1st SS Panzer Division had bounced off the 7th Armored Division roadblocks. The gap between the western anchor of the north flank at Vielsalm and the eastern outposts of the 82d Airborne Division was closed toward the end of the day when patrols from the 505th Parachute Infantry met a reconnaissance party from the 7th Armored south of Trois Ponts. In addition light tanks belonging to the 87th Cavalry Reconnaissance Squadron had established radio contact with the 3d Armored task force north of Samrée. On the whole it appeared that the north flank of the St. Vith force shortly would be battened down at its western terminus and that the danger of a German turning movement there had been removed. The main danger, apparent since 19 December, was the open south flank of the St. Vith defense hanging on the air at Holdingen. It was known that a German move northwest toward this open flank was in process-indeed the 116th Panzer Division and the 560th Volks Grenadier Division had been identified. Furthermore the 7th Armored trains had reported signs of an enemy force far to the west of the 7th Armored outpost positions. Acutely aware of the threat now forming, General Hasbrouck stripped such elements as he dared from his north flank, added the remnants of the 14th Cavalry Group, and created Task Force Jones (Lt. Col. Robert B. Jones, Commanding Officer, 814th Tank Destroyer Battalion) to guard the south and southwestern flank. Admittedly this scratch force was too weak to make a serious defense in the endangered sector, but it could be expected to block the key road junctions and sound a warning should the enemy attempt any flanking movement. received reinforcement late in the afternoon when a company of the 112th Infantry appeared. At an earlier and more optimistic hour this company had been dispatched to Houffalize with orders to make a counterattack southward to relieve the pressure on Bastogne. The company commander was persuaded that the situation had changed somewhat and that he should wait at Chérain for further orders. A little later a company of German infantry was detected marching north along the valley toward Chérain. During the night a few of the enemy entered the village but quickly were driven out. General Hasbrouck decided to wait further developments before committing any of his meager reserves at Chérain. The detachment which Jones had sent to Gouvy, midway between Deifeld and Chérain, was surprised to find the village occupied by German infantry. On 18 December the 7th Armored had learned in a roundabout way that a "Lieutenant Colonel named Stone" had collected a few troops and was holding Gouvy. Subsequently Hasbrouck sent a platoon of light tanks to help out and an injunction that it was "imperative" that the village be held. All through the day and night of 19 December German vehicles (units of the 116th Panzer Division and the advance guard of the 560th Volks Grenadier Division) had rolled past Gouvy to the south and west, but no attempt had been made to repeat the attack of the previous day. Stone sent out one of his staff to try to line up some help; this officer discovered the command post of the 965th Field Artillery Battalion, near the town of Beho, and put forth the case of the Gouvy defenders "who were attempting to hold the line despite their not being trained infantrymen." Battery C had been assigned to support the 112th Infantry and with the consent of the latter shifted its 155-mm. howitzers to give Stone's men a hand. Actually the pick-up force of quartermaster troops, light tanks, and stragglers under Stone's command was deployed so as to defend the railhead stocks at Gouvy Station east of the village proper, but this fact was unknown to the 7th Armored Division headquarters. During the night of 19 December the bulk of the 1130th Regiment, 560th Volks Grenadier Division, bivouacked in and west of the village of Gouvy. This regiment, which had sent combat patrols against Stone's force on the 18th, was at the tail end of the LVIII Panzer Corps columns pushing past Houffalize. It had become embroiled with the 112th Infantry at Sevenig, had suffered intensely (the fighting strength of the regiment now was between five and six hundred), and had been unable to disengage in the Our River sector as quickly as the rest of the division. The LVIII Panzer Corps commander was anxious to get the 1130th up to cover his right rear and had ordered the regiment to seize and block the St. Vith-Houffalize road in the neighborhood of Gouvy and Chérain. CHÉRAIN. A disabled German self-propelled gun is in the foreground. detachment arrived to set up the Gouvy roadblock, it found the Germans inside the village. The detachment drove them out in a sharp fight but at nightfall withdrew to a road junction a mile and a half to the west, here blocking any further German move toward the north. Stone's group was incorporated in Task Force Jones. The next day it was able, with some pride, to turn over to the 7th Armored Division the 350 German prisoners it had guarded since 18 December and the stores at the railhead. failed when the 4.5-inch guns of the 770th Field Artillery Battalion were cut off at Samrée en route from La Roche. Even when separated from the 7th Armored trains the St. Vith front was considerably stronger and better organized than it had been. Incidentally, the quick and forceful reaction to all German probing during the day and the fact that Hasbrouck had kept only a very small reserve out of the line had created an impression of American strength in the enemy headquarters well beyond the fact. The front held by the 7th Armored Division, CCB of the 9th Armored, and attached units by this time had expanded to about thirty-two miles. Traced on the map the line assumed the form of a horseshoe, the bend at St. Vith, the open prongs facing west. This opening had been partially covered by the advance southeastward of the 82d Airborne Division, but a gap of some five miles still existed north of the Chérain outpost set up by Task Force Jones. The VIII Corps passed to General Patton's Third Army during the 20th. Word of this, handed down by Colonel Ryan who had been at the VIII Corps headquarters in Neufchâteau and had worked his way back to the division trains, caused a little confusion as to the exact status of the units attached to the 7th Armored Division. In the early evening CCB, 9th Armored Division, received orders to revert to the VIII Corps and move that same night to St. Hubert, seventeen miles west of Bastogne. The loss of this combat command would create a wide breach in front of the enemy congregating south of St. Vith, a breach which hardly could be filled by the last reserves at Hasbrouck's disposal. The 7th Armored commander, at Hoge's request, got Middleton to cancel the order, and CCB, 9th Armored, subsequently was taken under the First Army command. The attachment already existing was thus legalized. What Hasbrouck needed now he tersely relayed in a message through the 7th Armored trains to the XVIII Airborne Corps: "We can hold if no troops are taken away from us and our right rear is given protection." The addition of the 7th Armored Division to the XVIII Airborne Corps had contributed greatly to the phenomenal expansion of a corps front which measured only some twenty-five miles on 19 December but which represented a sector of approximately eighty-five miles on the evening of 20 December. On the 19th most of Ridgway's troops had engaged in patrolling with no enemy contact; on the 20th the XVIII Airborne Corps faced the westernmost elements of the I SS Panzer Corps, the entire LXVI Corps, and the LVIII Panzer Corps. 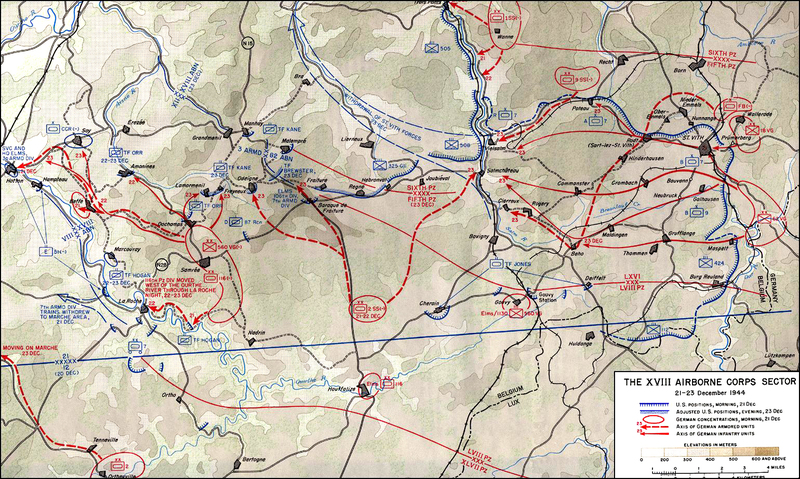 Additional infantry units, tank destroyers, and badly needed artillery were on their way to reinforce Ridgway's command, but the enemy force in opposition was strong and at most points along the extended front the initiative remained in German hands. this: pivoting on Malmédy, to continue the advance to the southeast and east with "utmost vigor," driving back the German forces found west of the line Malmédy-Pont-Vielsalm-Hebronval-Houffalize. That the enemy was prepared to contest this move all intelligence reports affirmed. True, Kampfgruppe Peiper had been pretty well bottled up on the corps left wing; but this effort had been made by thinning the line between Malmédy and Trois Ponts. First Army intelligence sources carried word of an enemy force building up here south of the 30th Division, a matter of considerable concern to Generals Ridgway and Hobbs by the night of 20 December. Furthermore, it was recognized that Peiper might try to break out through Stavelot. German documents, taken in the fight at Gouvy, showed clearly the intention of the LVIII Panzer Corps to drive on Hotton, at the moment the location of the 3d Armored Division command post. Already the advance guard of this force had pushed beyond Samrée. The St. Vith salient, where the 7th Armored Division was to remain on the defensive during the XVIII Airborne advance, was confronted with growing German forces on three sides. Prisoners had reported that the Grossdeutschland Panzer Division, previously identified on the Eastern Front, had joined the LXVI Corps before St. Vith. Even though the new armored outfit did not prove to be the famous division but Remer's much weaker panzer brigade, the report was of particular concern. to make an all-out attack and take St. Vith itself on 21 December, whether or not the Fuehrer Begleit Brigade was ready. This, one of his division commanders opined, was easier said than done. The course of battle on 21 December initially affirmed the pessimistic view with which most of German unit commanders seem to have started the attack. Remer, still missing most of his tanks, had been instructed to drive from Nieder-Emmels straight south into St. Vith. South of Nieder-Emmels the St. Vith road crossed the ridge where, the day before, the American tank destroyers had broken the back of the German attack before it could get rolling. The Fuehrer Begleit commander, with the independence that characterized the actions of a man who stood ace-high with Hitler, decided to shift the attack and take Rodt (Sart-lez-St. Vith), about two and a half miles west of his assigned objective. The rifle battalion assigned to carry out this mission happened to come under American artillery fire while assembling west of Nieder-Emmels before dawn, or thus Remer explains the failure to strike Rodt. So he compromised by sending a large combat patrol into the woods west of that village with orders to find a covered route along which the tanks might advance on Vielsalm once they arrived. The section of the main St. Vith-Vielsalm supply road west of Rodt was guarded by two American medium tank companies spread over a distance of three miles. It was easy for the German infantry to move unnoticed through the heavy timber. They even succeeded in ambushing enough vehicles, passing back and forth along the road, to promise motorization of the brigade's bicycle battalion. The American tankers caught on to what had happened when messengers and liaison officers failed to arrive at their destinations, but by this time the Germans had journeyed on to the southwest. Near Hinderhausen they attempted to surprise the 275th Armored Field Artillery Battalion, an outfit that had been exposed to close-quarter fighting before. With the help of two tanks and an antiaircraft artillery half-track mounting the dreaded .50-caliber quad, the artillerymen beat off the attack. When the raiders turned back to rejoin Remer they found the American tankers waiting; however, evasion in the woods was easy, although at this point the prized vehicles were abandoned and most of the captured Americans escaped. Meanwhile Remer's armored group had arrived north of St. Vith and the brigade was ready for attack as soon as darkness came. The American defense of St. Vith itself was based on the possession of ridge lines and hills masking the town to the northeast, east, and southeast. Two draws cut through this shield of high ground, one on the north represented by the highway running from Büllingen into St. Vith, the other angling from the southeast and traversed by the road and railroad line from Prüm. Directly east of St. Vith ran the Schönberg highway, which had been the avenue of the very first German attacks, but this road ran over a ridge just outside St. Vith where the Americans had stood successfully to meet all previous enemy thrusts. Much of the area here described was covered with dense stands of timber spaced irregularly with clearings between. Connecting the Büllingen and Schönberg approaches a spider web of secondary roads and trails ran back and forth, centering at the hamlet of Wallerode (two miles northeast of St. Vith) behind which lay a large forest. It was here that the unsuccessful attacks launched earlier by the 18th Volks Grenadier Division and the Fuehrer Begleit Brigade had formed. Faced with the problem of organizing and integrating a defensive line which had come into being piecemeal and with little regard to the integrity of the tactical units involved, the Americans divided command responsibility along easily discerned map features. Thus the draws coming in from the southeast marked the boundary between CCB of the 9th Armored and CCB, 7th Armored, while the northern defile and the Büllingen road designated the boundary between two sector commands within CCB, 7th Armored. The easternmost defenses, as a result, were in the sector bounded by the Prüm road on the right and the Büllingen road on the left, susceptible to penetration at either flank or both. This sector was under Lt. Col. William H. G. Fuller (commanding officer of the 38th Armored Infantry Battalion), whose command consisted of four companies of armored infantry, Troop B of the 87th Reconnaissance Squadron, and some four hundred men remaining from the 81st and 168th Engineer Combat Battalions (the men who had taken the first enemy blows at St. Vith), backed up by a tank company and a platoon of self-propelled 90-mm. tank destroyers. right wing of the 62d, this force attacking in the sector outlined by the two draws where Colonel Fuller's command was deployed. To the right of the main effort Remer's brigade was under orders to enter St. Vith by direct assault from the northwest via the Hünningen road, orders which he subsequently disobeyed. To the left the two remaining regiments of the 62d were to attack due west with the object of reaching the road between St. Vith and Maldingen; they would take no part, however, in the assault on St. Vith. By prodigious effort the LXVI Corps artillery finally had been wormed through the traffic jam east of St. Vith, and towed and manhandled into position. Around 1400 the German guns and Werfers opened up against Fuller's positions in front of the town. West of Wallerode the 295th Regiment started into the assault, possibly only as a feint, but withdrew as the guns supporting CCB, 7th Armored, went into action. This gambit was succeeded by a fifteen-minute artillery concentration; as it raised westward the main German attack moved forward. It was now about 1600 hours. One of the heaviest and longest-sustained barrages the veteran American combat command had ever encountered tied the troops of CCB to their foxholes, and even there tree bursts claimed many a victim. On both sides of the main Schönberg road the 294th Regiment moved groups of forty to fifty men forward in bounds through the woods. A platoon of Sherman tanks stationed just north of the road was caught in the thickest of the German concentrations. Three lost their commanders and the platoon withdrew. The first German waves then hit between Company A of the 38th Armored Infantry Battalion and Company A of the 23d Armored Infantry Battalion. Meanwhile the 293d Regiment had pushed south of the Schönberg highway toward Company B of the 38th Armored Infantry Battalion, Troop B, 87th Reconnaissance Squadron, and Company A, 81st Combat Engineers, left to right. Only two medium tanks were barring the road. For some reason this attack never fully developed-later German reports indicated that the assault waves lost their direction while moving through the thick woods. Suddenly, about 1700, the German pressure along the Schönberg road eased. The enemy had found a soft spot and was regrouping while his tanks and assault guns moved forward. General Lucht ordered the commander of the 18th Volks Grenadier Division to throw everything he had behind the 294th and continue the attack. North of the threatened area the 295th Regiment had come out of the woods behind Wallerode and started an advance southwest, covered by assault gun or tank fire from the ridge west of the town. This move brought the grenadiers across open ground and under flanking fire from American tanks located by the railroad underpass just north of St. Vith. At the same time Company A of the 38th Armored Infantry Battalion fired into their ranks from the front. American artillery joined in, the attack broke, and the 295th streamed back from whence it had come. before the 21st, but the lengthy and destructive barrage laid down by the enemy had caused very severe casualties and shaken the defenders. Sustained shelling had also destroyed all means of communication, except by runner, and left the little groups isolated and unable to support one another. Troop B of the 87th Reconnaissance Squadron and Company A of the 81st Engineer Combat Battalion, both directly in the German path, probably numbered less than forty men apiece when the final blow fell. It appears that if there were any mines left on the Schönberg road they had been lifted in preparation for a promised counterattack by American tanks. Actually there were only three Shermans on the main road, remnant of a reserve platoon which had been commandeered when the initial tank support had decamped. During the earlier lull the enemy infantry worked through the thick woods, penetrating the thin and disordered American line at a number of points. The final assault, made by the 294th and one or two platoons of Tigers, simply peeled the Americans back on both sides of the road. The three Shermans had aimed their guns to blast the first tanks as they came over the ridge where the American foxhole line had been drawn. In the darkness, and with radios and wire no longer functioning, the first sign of the enemy armor was a volley of flares fired in flat trajectory from the Panthers. Silhouetted in light and with blinded crews the Shermans were disposed of in one, two, three order. In a matter of minutes German infantry and tanks were to the rear of the foxhole line. Lt. Col. Thomas J. Riggs, Jr., commander of the 81st Engineer Combat Battalion, who had tried to organize a counterattack to wipe out the earlier penetrations was lost trying to organize a last-ditch defense in the hamlet of Prümerberg on the main road. No withdrawal orders reached the troops now behind the enemy. Some held where they were; some stampeded blindly through the woods in search of an exit to the west. A double column of enemy troops and vehicles marched along the road into St. Vith. On the right of Colonel Fuller's sector Company B of the 23d Armored Infantry Battalion and a platoon of the 814th Tank Destroyer Battalion, after having withstood almost continuous assault for four hours, succumbed about the same time to the 183d Regiment, which attacked along the draw from the southeast between CCB, 7th Armored, and CCB, 9th Armored. The 183d Regiment now poured through the draw into St. Vith. Two of the American tank destroyers reached St. Vith and here blocked the main street until nearly midnight, when one was destroyed by a bazooka round. Of the force originally commanded by Colonel Fuller in the eastern sector only some two hundred escaped, and half of these had to be evacuated for wounds or exhaustion. The loss here of the four armored infantry companies would be keenly felt by CCB, 7th Armored Division. was left of his command to fall back to the high ground west of the city, planning to anchor the new line on those of his troops who were still intact in the Nieder-Emmels sector, northwest of St. Vith. The troops east of St. Vith simply had to be written off (at least 600 officers and men) although some later would be able to work their way back through the German lines. The new defense ordered by Clarke began to form shortly before midnight. It was a ragged, piecemeal affair about two miles long, running south from Hünningen along the chain of hills a thousand yards west of St. Vith. Lt. Col. Robert C. Erlenbusch (Commanding Officer, 31st Tank Battalion) was charged with the organization of this new position. He and Lt. Col. Robert L. Rhea (Commanding Officer, 23d Armored Infantry Battalion), who had taken over from Colonel Fuller when the latter was evacuated because of exhaustion, were able to restore some measure of confidence and order. CCB, 7th Armored Division, be it remembered, was a battle-tested outfit of superior morale-as was the entire division-so credit also must go to the unnamed officers, noncoms, and men who withdrew in good order to the new line. Fortunately, the enemy, too, had to regroup before he resumed the battle. CCB, 9th Armored, also made readjustments to meet the new situation. General Clarke had informed General Hoge, whose command post was close at hand, that his command was moving back to re-form west of St. Vith. Since the shift would leave Hoge's northern flank open, it was agreed that contact between the two combat commands would be re-established at Bauvenn, necessitating that Hoge's left be pulled back some two thousand yards. This was accomplished. The remainder of CCB, 9th Armored Division, remained in the positions on the ridge line west of the Braunlauf Creek and draw. About 2200 General Clark reached General Hasbrouck with word of what had happened at St. Vith and the latter immediately informed the XVIII Airborne Corps. But this was not all that the 7th Armored Division commander had to report. Earlier, Task Force Jones (deployed on the southern flank of the salient) had captured a German engineer officer who, under questioning, said that his division, the 2d SS Panzer Division, was moving toward Gouvy. Thus far the 2d SS Panzer Division had not been located. Its presence on the weak southern flank (in case the captured officer was not a "plant") was disturbing. Apparently General Hasbrouck accepted the veracity of the report (he could hardly risk the chance that it was not true) and so recommended that General Ridgway send the 3d Armored Division east and south to meet this new enemy. Already Hasbrouck had ordered Task Force Jones to shorten its line because the last reserve available behind the southern wing (the 17th Tank Battalion) was en route to reinforce CCB. Without Wemple's tanks, or with them, Task Force Jones was no match for any large detachment of the 2d SS Panzer Division. new orders to Hasbrouck (it was now about 0200 on the 22d). The 424th and 112th Infantry Regiments were to withdraw from their positions. The entire force under Generals Hasbrouck and Jones was to form a defensive ring west of St. Vith and east of the Salm River. By early morning of the 22d the withdrawal of the southernmost units was under way and the circle was beginning to form. The command situation finally was "regularized" when Ridgway gave Maj. Gen. Alan W. Jones the command of the 7th Armored Division (he ranked Brig. Gen. Robert W. Hasbrouck) in addition to his own division and its attachments. Actually this change had no effect on the conduct of subsequent operations and was effective for only a few hours. In studying the map of the area it will be noted that the troops were to be disposed surrounding a forest through which there was a paucity of roads. There was practically no possibility of being able to shift forces to meet a threat at any point How units were to be supplied in such a situation is not understood. Air supply of such a large and scattered force would have been most difficult. Without supply the force would have been through in two or three days. Fortunately for the forces in the salient the withdrawal to the "goose egg" defense, a move made with extreme difficulty on muddy and congested roads and trails, was unhampered in its first phases by any German reaction. The occupation of St. Vith had considerably disorganized the attacking division, whose regiments jammed into the town from east, north, and south. Orders given the 18th Volks Grenadier Division early on the 22d to continue the attack along the main road through Rodt and Poteau toward the Salm River could not be carried out for some hours. On the left the bulk of the 62d Volks Grenadier Division was still confronted with an unbroken defense. 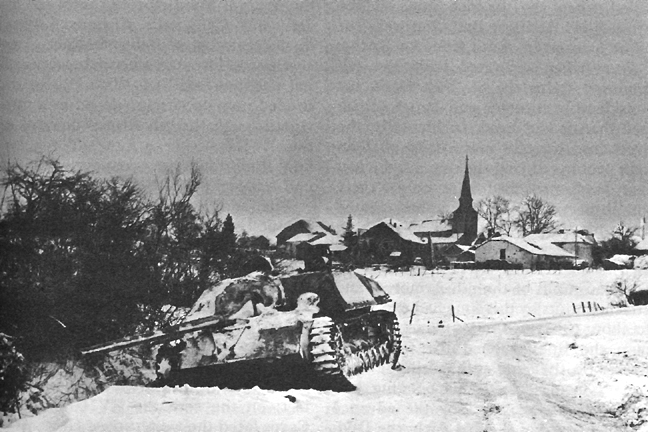 The only force in position for an immediate exploitation was Remer's Fuehrer Begleit Brigade, whose tanks finally had arrived on the evening of 21 December. TANKS OF THE 7TH ARMORED DIVISION in a temporary position near St. Vith. under way in the 7th Armored zone, Rodt was the junction point between CCA, still holding the division north flank, and CCB, raising a new line along the low hill chain that extended south of the village. The ground at Rodt, then, overlooked the flank and rear of CCB. The village itself was garrisoned by the service company of the 48th Armored Infantry Battalion and some drivers belonging to the battalion whose vehicles were parked there. Astride the woods road running north to Recht were small blocking detachments of tanks, engineers, and antitank guns. Between Rodt and the next village to the west, Poteau, two companies of medium tanks patrolled the main road and watched the trails running in from the north. To the northeast the troop from CCB which originally had held the left wing of the St. Vith sector around Hünningen was still in position; as yet it had not sustained any heavy blows. in the cellars, but most of the battalion finally had to pull back. A number of prisoners were later rounded up by the Americans on the Recht road. The second German assault was made in a more methodical manner. First, mortars went to work against houses and foxholes. Then the German tank group, which had been delayed by a mine field, and an infantry company or two swung to the west and rolled down the main road into the village. The Sherman tanks on the Recht road were caught in masked positions from which they could not return the panzer fire coming in from higher ground, and the troops in Rodt could not stand alone against the Panthers. The enemy took the village quickly, and with it many of the half-tracks belonging to the 48th Armored Infantry Battalion. Word that the St. Vith-Vielsalm road had been cut at Rodt reached Lt. Col. Vincent L. Boylan, Commanding Officer, 87th Cavalry Reconnaissance Squadron, who took charge of the few troops of CCB remaining north of St. Vith on the wide open flank. Boylan got orders from Clarke to withdraw south at once. Despite a brush with Remer's group and the loss of several tanks in the swampy ground south of Rodt the command reached Crombach and Hinderhausen, where General Clarke was building a second line of defense. This line was now gravely endangered on its open north flank by the German position astride the ridge at Rodt. In the meantime, Colonel Rosebaum, the CCA commander, sent two of his tank companies east of Poteau to engage Remer's tanks. In a long distance duel along the ridge the Shermans were out-ranged. Rosebaum asked for some tank destroyers, hoping to stop the Panthers if they should turn west from Rodt. Remer's objective, however, was not in that direction. All during the morning of 22 December American observers had watched enemy troops and vehicles milling around Recht, just to the north of Poteau. Here the first identification was made of the 9th SS Panzer Division. This fresh armored division was in fact moving its main strength west from Recht toward the Salm River and collision with the 82d Airborne Division, but a kampfgruppe had been dropped off to cover the south flank of the division by attacking in the direction of Vielsalm. With the discovery of this new enemy force in the north and the knowledge that the only route of withdrawal remaining to CCA was along the road from Poteau to Vielsalm, Colonel Rosebaum gave over the effort against the Fuehrer Begleit armor and gathered the major part of his command in a circular defense around the Poteau crossroads. As yet he had only vague information of the serious situation confronting the American troops in the south and southeast. light tank company, three platoons of 90-mm. tank destroyers, two troops of cavalry, and the equivalent of four or five rifle companies. But unit integrity had been lost, the armored components were far below strength, and many of the armored infantry were weary, ill-equipped stragglers who had been put back in the line after their escape from St. Vith. General Clarke's plea for reinforcements brought in a rifle company, a company of tank destroyers, and a few light armored vehicles. That was all. Supplies were running short and the ground now occupied was not well adapted to defense. Still worse, CCB had no friendly contact on the north, and a patrol sent to establish connection with CCB, 9th Armored, on the south had disappeared. The fact was that the 62d Volks Grenadier Division had thrust a force through the woods and along Braunlauf Creek into the gap between the two combat commands. It will be recalled that on the night of 21 December General Hoge had set in motion a withdrawal of the northern flank of CCB, 9th Armored, to conform with Clarke's first defensive position just west of St. Vith. 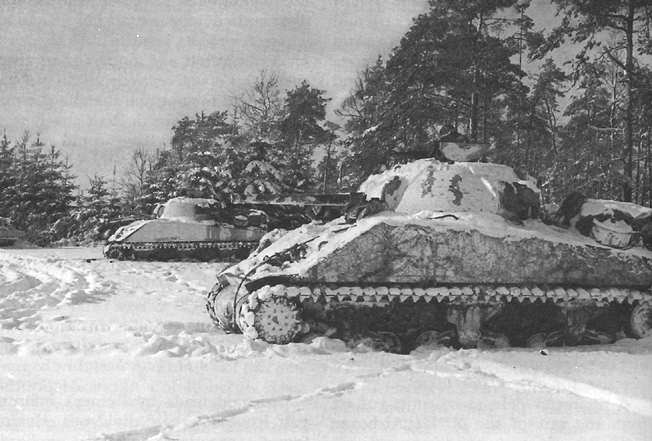 In blinding snow, on slippery roads, 9th Armored tanks and infantry headed for Bauvenn, designated as the linkage point for the two combat commands. Confusion, darkness, and mud slowed the move, but by morning a medium tank company and a platoon of riflemen had reached the village. the connective tissue between the 7th and 9th Armored combat commands. The course of the valley westward proffered a natural line of advance, and through it, in the early hours of the 22d, pushed small detachments of the 62d Volks Grenadier Division. Undetected, a German rifle company reached Neubrueck, in the valley southwest of Bauvenn, where the command post of the 27th Armored Infantry Battalion was located. About 1000 the enemy rushed the village and killed or captured the entire battalion staff. A counterattack thrown in by a scratch force of infantry and tanks from Bauvenn drove the Germans out and freed those Americans still alive. In a subsequent readjustment of the CCB line to round out the goose egg, Hoge's tanks and infantry were arrayed from Neubrueck south and west through Grufflange and Maldingen. Late in the afternoon a battalion of the 424th Infantry was added to the line, but as yet the enemy made no appearance in force in this sector. The LXVI Corps was in no position to capitalize with speed and immediate effect on its capture of St. Vith. As the intermingling of roadways at St. Vith had made it possible for the defenders to bar the way west, so now this knot in the Belgian-German road prevented a quick transfer of men and guns in pursuit. Of the LXVI Corps only those units which had swung wide of the city during the attack were able to maintain pressure on the Americans: the Fuehrer Begleit Brigade, executing its semi-independent turning movement, and the advance guard of the 190th Grenadier Regiment, inserting a company or so between the two CCB's. In the course of the night battle at St. Vith the German assault units had become badly scrambled. The problem involved in extricating and reforming these units was enhanced by the natural desire of the German soldiers to make the most of this opportunity to sleep for a little while in warm billets. Service and army troops, with and without orders, jammed into the city in a kind of scavenger hunt for anything usable that the Americans had left behind. The Sixth Panzer Army, thus far unable to win enough roads for a mass movement to the west, turned its reserve formations into the roads threading into the city. The traffic jam thus created was made worse by the horde of officers and men driving American vehicles captured in the Schnee Eifel who were grimly determined to hang onto their loot. 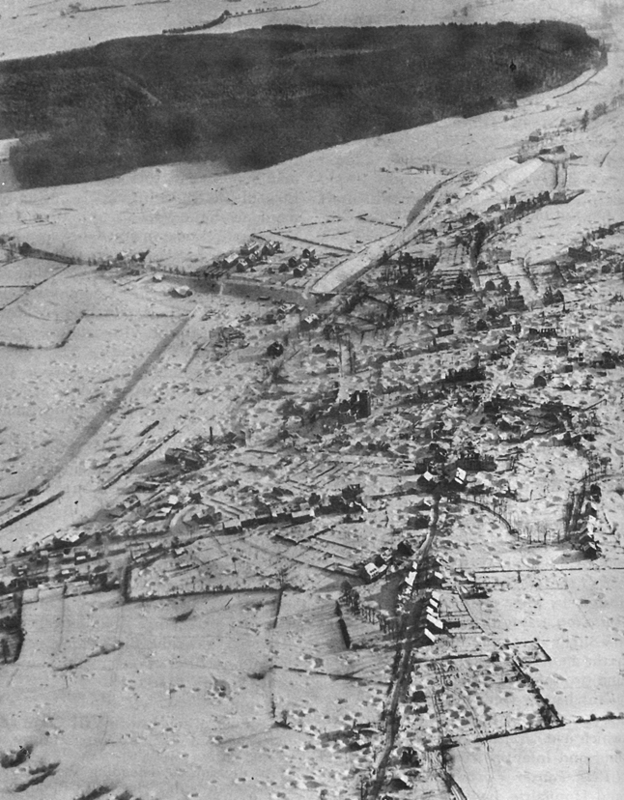 By midmorning of 22 December the flood of vehicles streaming into St. Vith was out of control. For some hours the columns could move neither forward nor back, and when Field Marshal Model arrived on the scene he was forced to dismount and make his way into the city on foot. Corps and division military police, too few in number for a traffic problem of this magnitude, were brushed aside. The volks grenadier officers who tried to restore some semblance of order found the SS officers of the army units truculent and unyielding. Divisional and corps artillery; emplaced with great effort in the woods east of the city, now had to be snaked out along the narrow, muddy, woods trails and wedged piece by piece onto the overburdened roads entering St. Vith, Even the batteries supporting the 62d Volks Grenadier Division on the south flank were brought to a standstill in the mire on the bypass through Galhausen. to the XVIII Airborne Corps commander setting forth the hard facts of the case already put to the British captain.
. . . Unless assistance is promptly forthcoming I believe our present position may become serious for several reasons, namely: a. Our supplies must come in through a bottleneck over a bridge near Vielsalm. b. We may become subjected to enemy artillery fire from practically any direction. c. The road net within our position is totally inadequate to the troops and vehicles concentrated therein. The map shows many roads, but on the ground, the majority of these are mere tracks on which even a jeep bogs down if more than two or three travel on it. d. If the 2d SS Panzer Division attack should succeed in driving back the two RCTs of the 82d Airborne Division now between Salmchâteau and Hebronval even as little as 3000 yards we will be completely severed from any source of supplies. Since the chances of assistance in the immediate future do not seem bright, I would like to suggest that consideration be given to withdrawal of the 7th Armored and 106th Divisions to a position to the right (west) of the 82d Airborne Division where they may be of assistance in halting a possible advance north by the 2d SS Panzer. The withdrawal of CCB, 7th Armored Division, last night from St. Vith was expensive. So far we are missing at least one half of Clarke's force. Of course many of them will show up, but they will be minus weapons, ammunition, blankets and rations as well as at a low physical level. I don't think we can prevent a complete break-through if another all-out attack comes against CCB tonight [italics supplied] due largely to the fact that our original three infantry battalions have at present melted to the equivalent of only two very tired battalions. It was about an hour before noon. Hasbrouck had not yet sent his message to Ridgway when word came of the German advance against the north flank of CCB, 7th Armored, in the Rodt sector. General Hasbrouck now had a postscript to add, one bringing tenseness and urgency to the precise military form and phraseology of the main text. P.S. A strong attack has just developed against Clarke again. He is being outflanked and is retiring west another 2,000 yards refusing both flanks. I am throwing in my last chips to halt him. Hoge has just reported an attack. In my opinion if we don't get out of here and up north of the 82d before night, we will not have a 7th Armored Division left. RWH. This message reached Ridgway's headquarters ten minutes before noon. Hasbrouck was not alone in this apprehensive view of things to come. Over the field telephone General Jones concurred in the opinion furnished Montgomery and Ridgway, but at 1250 Jones dispatched a memo to Ridgway saying, "My intentions are to retain the ground now defended." Without further orders the two commanders, their staffs, and subordinates set to work on plans for demolitions and a rear guard stand to keep the escape routes to the Salm open. During the afternoon the 7th Armored Division trains, whose officers and men had done a remarkable job in supporting the troops in the salient, got through one last supply column of ninety vehicles to Salmchâteau. The arrival of gasoline, rations, ammunition, and the presence of a few replacement vehicles in the division park would make the last-ditch stand or withdrawal, whichever it might be, a little easier. In the chain of command only General Ridgway demurred. He still hoped to counterattack and restore the line Malmédy-St. Vith. As an airborne commander thoroughly indoctrinated in the concept of isolated action by units cut off from friendly ground contact and supply he took a sanguine view of the ability of the goose-egg defenders to hold until the projected corps counterattack relieved them. This optimism, as the record shows, was not shared by the commanders in the ring itself. At 1500 a radio message from the XVIII Airborne Corps headquarters informed Hasbrouck that the "request of CG, 7 AD" for withdrawal had been approved. With this concrete mission assigned, planning began for the extremely difficult job of disengaging from an enemy who might continue the attack at any moment. Even as a logistical exercise withdrawal presented a tricky staff problem. The roads to be used were few and in poor state, the troops and vehicles to be moved were so numerous that a thirty minute gap in a column on any one of the roads would be serious. The 7th Armored Division, CCB of the 9th Armored, the remnants of the 106th Division, and the sizable attached units all would have to make their westward exit through a 3,000-yard-wide bottle-neck with only two bridges, those spanning the Salm River at Vielsalm and Salmchâteau. To achieve the tight control needed in this type of operation General Ridgway ordered General Hasbrouck to take charge of all the troops in the ring, General Jones becoming assistant to the corps commander and General Hoge being named deputy commander of the 7th Armored. The plan for withdrawal, slowly and carefully worked out by Hasbrouck and Colonel Ryan on the evening of the 22d, envisaged a progressive siphoning from the units farthest to the east in which these troops passed gradually into the main routes leading to the bridges while rear guard forces staged holding actions in echelon along the roads and trails. Originally three routes were chosen: a northern route along the Poteau-Vielsalm road; a center route from Commanster to the Vielsalm bridge (nothing more than a poor woods road); and a southern route via Maldingen, Beho, and Bovigny, thence north along the Salm valley road to the Salmchâteau bridge and east along the Salmchâteau- La Roche road by way of the Baraque de Fraiture crossroads, which at this time was still in American hands. specific instructions for the unit to which they were sent. At 0030 on the 23d General Hasbrouck informed General Hoge that his combat command, which was to initiate the move west, would begin withdrawal at 0200. By this time both Hoge's and Clarke's combat commands were under attack. The two commanders consulted, agreed that Hoge could not break loose and thus expose Clarke to encirclement from the rear, and telephoned Hasbrouck at his command post in Vielsalm that the withdrawal must be delayed. Meanwhile the hours of darkness were slipping away. The bulk of the LXVI Corps remained wedged in the streets of St. Vith or backed up along the roads funneling in from the east. But the combat echelons of the two regiments of the 62d Volks Grenadier Division which had bypassed the city on the south were in position by the night of the 22d to renew the attack. A few tanks, light armed reconnaissance troops, most of the division engineers, and considerable rifle strength struck through the dark against the eastern arc of the loosely organized American ring. At first there was no artillery forward to give weight to the assault, but densely wooded approaches and darkness gave the advantage to the attackers. At Crombach, in the sector held by CCB, 7th Armored, the attack came in along the railroad, and the American tanks again were blinded by high velocity flares which gave the first clear shot to the enemy armor. East of the village American infantry and engineers were aided by friendly gunners, for the 434th Armored Field Artillery Battalion had received some ammunition when the trains came in and its forward observers were well posted. A protective barrage dropped in a half moon, sometimes no more than three hundred yards in front of the American foxholes, checked part of the 190th Grenadier Regiment east of Crombach. But some Germans filtered into town from the north and started hunting down the American tanks and assault guns. With little protection against the German bazooka teams a number of the fighting vehicles pulled out of danger. Colonel Wemple and other officers restored a line, but when daylight came it was hard to tell whether friend or foe really held Crombach. in firing position) and a massed infantry assault drove the troopers out. When ordered back into the village the cavalrymen found it jammed with German infantry. By daylight small hostile groups had pushed far to the west in the sectors of the two armored combat commands'. Some had even climbed out of the Braunlauf valley and engaged in scattering fire against the battalion of the 424th Infantry in the reserve position at Maldingen. In general, however, the battle was waning all along the eastern arc, bringing a brief respite to the men in the foxholes, now subjected to a freezing, blasting wind after hours of fighting in snow and slush. Although no major disruption had occurred in the ring defense, the night attacks had developed cracks in the line at Crombach and in the valley of the Braunlauf which would widen under a little more pressure. Most important, the 62d Volks Grenadier Division had robbed the Americans of their chance for a night withdrawal. The situation is such on the west of the river south of [the] 82d that if we don't join them soon the opportunity will be over. It will be necessary to disengage whether circumstances are favorable or not if we are [to] carry out any kind of withdrawal with equipment. Inform me of your situation at once particularly with regard to possibility of disengagement and execution of withdrawal. General Hoge, whose combat command was first in the march table, was able to give a favorable answer, but all this last-minute improvisation took time. As a result, orders charging CCB, 9th Armored, to pull out at 0600 were received in Hoge's command post at 0605. About ten minutes later the withdrawal commenced, running smoothly to conclusion. One tank company was left as rear guard north of Maldingen, there blocking the approach from the German concentration area at Galhausen, but the enemy reacted slowly and the rear guard got away with the loss of only two tanks. A small cavalry detachment, Task Force Lindsey (Capt. Franklin P. Lindsey, Jr.), remained through the morning, screening the exit route at its Maldingen entrance. The first phase of the withdrawal had been auspicious. Be it noted, however, that the southern route (via Beho, Salmchâteau, and through the 82d Airborne lines at Lierneux) followed a hard-surfaced motor road, that as yet there was little traffic congestion, and that the enemy efforts prior to the withdrawal had not disorganized the command but had simply forced its left flank closer to the avenue of escape. won partial control of Crombach and were sitting across the road in the rear of the American tanks and riflemen to the east of the village. But the assault guns which had pulled out of Crombach and gone-south during the night battle now came handily into play. At 0718 Wemple sent the guns blazing into the western side of the village in an attempt by smoke and shell to drive the Germans off the streets. The enemy grenadiers and gunners refused to stay put. When the American tanks rolled in from the east, two of the leaders were hit by antitank fire and left helplessly blocking the road. Fate took a hand to save the rest of the column. During the night a quick freeze had hardened the ground just enough to allow the tanks and half-tracks from the east, covered with clinging foot troops, to swing cross-country and south to the Braunlauf road. Even so, a number of vehicles mired and had to be abandoned at the soft banks of a small stream. At Braunlauf the column found a company of the 424th Infantry in a fire fight with German infantry who had sneaked in during the night. The tankers, mindful of their passengers, could not use the tank cannon; so the column rolled through the streets with the infantry riders firing wildly in every direction. The Germans were somewhat disconcerted, but snipers accounted for two American officers. The rest of the journey behind Hoge's columns into the 82d Airborne lines was without incident. By noon most of the 424th Infantry and Wemple's force were across the Salm. Of the southern half of the original ring there remained only the rear guard and covering forces strung along the roads east of Salmchâteau. The bulk of CCB, 7th Armored Division, represented by Task Force Lohse (formerly Erlenbusch), commanded by Maj. Leslie A. Lohse, and Task Force Boylan, started to withdraw shortly after daybreak, Boylan's command acting as the division rear guard. Maneuver by these elements of CCB was rigidly constricted by the presence of the Fuehrer Begleit armor in the north around Rodt and by the German hold on Crombach. Access to the Poteau-Vielsalm route in the north or the Beho-Salmchâteau route in the south was no longer possible. There remained a narrow, rutted trail running from Hinderhausen (around which Task Force Boylan was deployed) west through the woods to the crossroads at Commanster, from which a secondary road ran to the bridge at Vielsalm. This jeep trail-it was no more-had been reconnoitered by General Clarke on the 22d and designated (with much misgiving) as an emergency exit. The emergency had arrived, fortunately along with the sudden freeze that gave a surface hard enough to bear the weight of armored vehicles. Even so the one-way trail was a poor and precarious road to safety; a sudden thaw or one tank askew could trap both Lohse and Boylan. the village, then funneled slowly into the woods. One tank threw its track on the one-way stretch but obligingly coasted off the trail and into the trees. At Commanster a traffic jam started. Most of the nine field artillery battalions in the ring had been grouped in this area and their displacement-while some batteries remained to keep up fire-was a slow, painful process. General Clarke took a hand here as a kind of super traffic cop until the jam cleared. By noon Task Force Lohse and most of the artillery had crossed the river at Vielsalm. Having cut the St. Vith-Vielsalm road by capturing Rodt in the late morning of the 22d, Remer's Fuehrer Begleit Brigade made no serious attempt to push beyond Rodt, either against CCA, 7th Armored Division, to the west or CCB to the south. Remer's heavy Panthers had made bad going of the muddy roads north of Rodt. Only a few arrived in time to take part in the battle there; for the rest of the day and far into the night the Panthers crawled into the Rodt assembly area. The Fuehrer Begleit trains could not negotiate the churned and mired trails at all. They would have to be threaded through the St. Vith bottleneck. In the early morning of 23 December Remer gathered a truck-mounted battalion of armored infantry, put some tanks at their head, and started them for Hinderhausen, with the intention of cutting south across the rear of the Americans. About 0800 the Panthers engaged the small covering force at Hinderhausen. A brace of 90-mm. tank destroyers knocked out two of the lead tanks, temporarily halting the attack and giving Lohse's column time to reach Commanster. When the Germans finally maneuvered into position to renew the attack, the Americans broke free and fell back toward Commanster. German infantry and a few tanks pursued but were held off until the last of the CCB column had been pushed through the village and was on its way northwest to the Vielsalm bridge. Colonel Boylan led the rear guard back toward the bridge but then was ordered, because of a traffic jam at the bridge, to hold on the east bank until the 7th Armored Division headquarters could cross. This covering force consisted of a few light tanks, a couple of tank destroyers and a few rifle squads from the 112th Infantry. The Fuehrer Begleit Brigade did not follow CCB. Remer's orders were to join the LVIII Panzer Corps west of the Salm, and his immediate design was to reach the paved road leading to Salmchâteau. The motorized rifle battalion, now led by an assault gun company, headed south toward the road center at Beho, found it free of American troops, and there joined a part of the 62d Volks Grenadier Division. The time now was midafternoon. middle of the afternoon at Bovigny some three and a half miles south of Salmchâteau on the west side of the Salm River. To protect the valley corridor through which Task Force Jones would have to move some companies of the 112th Infantry were still left east of the river in the villages of Rogery and Cierreux. When CCB of the 9th Armored, the 424th Infantry, and the larger part of CCB, 7th Armored, had peeled away in layers from the ring, the last two combat commands of the 7th Armored defending the Poteau-Vielsalm highway had to be drawn off. At Poteau, five miles from the river, CCA stood facing the enemy to north, east, and south. CCR maintained its cordon along the valley road. The Americans did not know that the troops of the 9th SS Panzer Division, who in past days had made raids from Recht southwest toward Poteau, were few in number and that only the day before the main body of the 9th SS Panzer Division had started on a forced march to the northwest in an attempt to break through to Kampfgruppe Peiper, now nearing the end of its tether. The German force left at Recht was no more than a screen, although under orders to maintain pressure on Poteau. To the east of CCA, 7th Armored Division, however, some part of the 293d Regiment of the 18th Volks Grenadier Division finally had worked its way through St. Vith, arriving during the night of 22 December at Rodt. After some confusion in getting through the Fuehrer Begleit Brigade around Rodt on the morning of 23 December, the 293d continued along the road to Poteau. Again a confused command situation took its price. The infantry and assault guns in the 9th SS Panzer Division screen mistook the newcomers for a withdrawing American column and poured in heavy flanking fire. It was some hours later-and the Americans had decamped-when the 293d finally entered Poteau. Poteau lends itself well to defensive action. It stands at the entrance to the valley road which leads to Vielsalm, and mechanized attack from either Recht or Rodt had to funnel through the narrow neck at this crossroads, vehicle maneuver off either of the two approaches being almost impossible. Away from the crossroads the ground rises sharply and is cluttered with thick stands of timber. The formation adopted by CCA was based on a semicircle of ten medium tanks fronting from northwest to east, backed by tank destroyers and with riflemen in a foxhole line well to the front. About 1035 the blocking troops left by the 9th SS Panzer Division made an attack. Tank and artillery fire stopped the Germans just as it had on previous days. Perhaps the enemy would have returned to the fray and made the final withdrawal hazardous, but shortly after noon some P-38's of the 370th Fighter Group, unable to make contact with the 82d Airborne Division control to which they were assigned, went to work for the 7th Armored Division, bombing and strafing along the road to Recht. The enemy recovery was slow. fired a few final salvos to discourage pursuit. When the last vehicle of CCA roared over the Vielsalm bridge (at 1620) the remaining artillery followed; then came the little force from CCR which had held the road open while CCA made its withdrawal. Darkness descended over the Salm valley as CCR sped across the Vielsalm bridge. The vacuum which had existed for some hours in the northern reaches of the one-time ring had filled rapidly in the late afternoon as the 18th Volks Grenadier Division brought its infantry out of St. Vith. Through most of the confusion and immobility characterized the St. Vith bottleneck. But the process of disentangling this mass of men and vehicles was speeded up considerably during the afternoon when the 402d and 485th Squadrons (370th Fighter Group) winged their bombs onto the city and its approaches. By dark the 293d Regiment was marching through Poteau and the rest of the infantry formations of the division were jumbled along a five-mile front on the east side of the Salm. Control, as the 18th's commander later reported, was almost nonexistent. As a result the small body of riflemen from the 112th Infantry and Boylan's tiny armored rear guard were able to see the headquarters of the 7th Armored safely across the Vielsalm bridge and to withdraw themselves through that city without much interference from the enemy closing along the river. This was sometime after 1900. Although troops of the 18th Volks Grenadier Division or the 9th SS Panzer Division fired on Boylan as his detachment reached the river, they made no attempt to rush the bridge-a fortunate circumstance, as it turned out, for when the 82d Airborne engineers tried to blow the bridge the charge failed to explode. It was after midnight when the engineers finally reported that the charge had been replaced and successfully detonated.7 Even then the span was only partially wrecked and was still capable of bearing foot troops; but the German tanks milling about the burning buildings east of the river would have to find other means of crossing the Salm. orders I ever issued," the 7th Armored commander sent his "division reserve" -two tank destroyers-hurrying south from Vielsalm. One of the tank destroyers arrived just as a German tank platoon hove into sight at Cierreux, hit the two leaders, and drove off the five remaining tanks. During the lull that followed, a platoon of light cavalry tanks and a section of towed tank destroyers came east from the river road to give a hand. Colonel Nelson, commanding the 112th Infantry, had sent a radio message some time around 1300 telling Hasbrouck that the withdrawal east of the river had been completed, that only the 112th covering force remained. Nelson waited for three hours for the division order to withdraw (a liaison officer with such an order had left Hasbrouck's command post at 1345). Then, with German tanks only two hundred yards from the regimental command post, lacking any communication with the 7th Armored headquarters, and out of touch with what was happening elsewhere, he gave the word to pull out of Salmchâteau. By this time Task Force Jones was moving along the Bovigny-Salmchâteau road which traversed the narrow defile cut by the Salm River. The infantry, considerably disorganized, had just crossed the river west of Cierreux and started feeding into the 2,500-yard-long column on the valley road when word passed down the line that the light tanks in the van had been hit by enemy fire as they entered Salmchâteau. Here was the column, straitjacketed on the valley floor by high ridges to either side, unable to move forward or back, and with the enemy apparently closing in from every side. But Colonel Nelson his executive officer, Col. William F. Train, and a few other officers set to work to organize a breakout. Actually the column was blocked at Salmchâteau before the pursuing troops of the Fuehrer Begleit Brigade caught up with the tail. This bridgehead village lay in the outpost line of the 508th Parachute Infantry. Just north, the wing of the 82d Airborne defense running west to the Baraque de Fraiture crossroads (and junction with the 3d Armored Division) rested on the Salm River. In the late afternoon of the 23d the single company of the 112th Infantry at the eastern end of the Salm River bridge had been attacked by a larger force from the 62d Volks Grenadier Division. The Americans had blown the bridge and fallen back through Salmchâteau to the lines of the 82d, whereupon a few of the Germans crossed the river and entered the village. The stopper was more firmly seated in the bottleneck just at dark with the arrival of a detachment from the 2d SS Panzer Division coming in from the southwest. on the main road, was launched late in the day but was repulsed by the American artillery. Krag decided to shift his advance toward Salmchâteau and there possibly link up with friendly forces he knew to be coming from St. Vith. He had available nearly three reconnaissance troops and an assault gun battalion. His accompanying battalion of self-propelled artillery was within range of Salmchâteau. A sharp attack in the late afternoon brought Krag's detachment through the American outposts in the hamlets west of Salmchâteau and by nightfall he had a troop in the south section of the town, its task made easier by the preliminary shelling laid in by the battalion of field guns. From this point on Kampfgruppe Krag fought two battles, one to mop up the town, the other to capture American vehicles trying to break out of the valley road in the south. As the evening wore on, the leading Americans bottled up in the defile hastily organized an attack to open the exit through Salmchâteau, but there was little room to deploy, and this attempt failed. At the tail of the column disaster, in the form of the Fuehrer Begleit advance guard, suddenly struck. The light tanks and tank destroyers, earlier disposed at Cierreux, and now brought back to form the column rear guard, were spotted by German scouts and set upon in the dark by assault guns that lighted their targets with high velocity flares. Several of the American fighting vehicles were destroyed before they could return fire. To make matters worse some engineers blew a culvert, trapping the tail of the column. In sharp fighting most of the mechanized force at the tail was destroyed. This was not to be the end. A trail had been discovered leading west out of the valley, and most of the middle of the column, led by a light tank company, escaped over it. Fortunately bright moonlight allowed some maneuver. Striking northwest and fighting off the small blocking forces left behind by Kampfgruppe Krag, the bulk of this part of the column succeeded in reaching the 82d Airborne. By midnight on the 23d over two hundred men from the column had reached the 508th Parachute Infantry and many others straggled in before daylight. How many vehicles and men were captured by the enemy is impossible to say. There is a postscript to this story. During Task Force Jones's disengagement the 440th Armored Field Artillery had emplaced to give covering fire and protect the flank of the task force. When the 440th commenced its withdrawal word came in that the Germans had blocked the designated crossing site at Salmchâteau. Thereupon the 440th formed in column, cut loose with every available machine gun, knifed through the startled enemy, and roared over the bridge at Vielsalm. The losses sustained by the defenders of St. Vith must be measured against their accomplishments. They had met an entire German corps flushed with easy victory and halted it in its tracks. They had firmly choked one of the main enemy lines of communication and forced days of delay on the westward movement of troops, guns, tanks, and supplies belonging to two German armies. They had given the XVIII Airborne Corps badly needed time to gather for a coordinated and effective defense. Finally, these units had carried out a successful withdrawal under the most difficult conditions and would return again to the battle.